Officially the dispute can be traced all the way back to 2008, when the ASA made a decision to allow so called slower “hybrid fibre” or “part fibre” services (e.g. FTTC, G.fast or HFC DOCSIS networks that combine fibre with slower metallic copper or aluminium wires) to use the same wording as pure “full fibre” (FTTH/P) ISPs that take the optical fibre cable all the way to your home or office. Pure fibre optic ISPs can deliver significantly faster speeds (multi-Gigabit or even Terabit speeds) than metallic cables and are generally much more reliable, particularly over long distances. Experiences do vary, depending upon the network setup and length of the line, but generally there’s a huge difference (Will the real fibre optic service please stand up?). In the past few paid attention to this debate, which is partly because FTTP/H networks barely even existed, but today such operators are in a race to deploy pure fibre services out to millions of UK premises (see our summary). As a result it has become vital for ISPs to be able to highlight the advantages of a pure fibre vs part fibre line, which is much more difficult when your part fibre rivals can use identical terminology. Last year the ASA finally, under a lot of pressure, agreed to review the situation but in the end they only recommended minor tweaks (here). In its conclusion the ASA claimed that “fibre” wasn’t a priority identified by consumers when choosing a package; that consumers did not notice “fibre” claims in ads and that they saw it as a shorthand buzzword to describe modern fast broadband. Overall consumers told the ASA that they did not believe they would change their previous decisions, even after the differences between those and broadband services that use fibre optic cables all the way to the home were explained to them. In response they fought a legal battle in the UK High Court (Cityfibre’s challenge focused upon whether the advertising watchdog followed the correct legal approach in reaching their conclusion) and in June 2018 secured a Judicial Review against the ASA’s position (here). Hyperoptic also supported Cityfibre in the case. The ASA was then given a chance to have their say and today the court made its ruling, albeit by finding in the ASA’s favour. “We welcome the Court’s decision which finds in the ASA’s favour on all grounds and dismisses CityFibre’s arguments. The review of the evidence we undertook to arrive at our position on the use of the term “fibre” to describe part-fibre services in ads was based on robust methodology and open minded analysis of all of the arguments. The move will come as a blow to Cityfibre and their supporters in the campaign, although we suspect it may not halt their drive for a change in approach. The outcome has only just come in and as a result we expect to update again later with more comments and details from the case. Admittedly it would have proven very difficult to unpick something that has long since become established into the consumer subconscious, where the meaning of “fibre” has been diluted over a decade of use (or misuse) by slower hybrid (part) fibre services. After a bit of hunting around we’ve been able to find the case document, although it’s a heavy read and focuses more upon how the ASA arrived at their decision (i.e. the research base and interpretation) than debating the differences between technologies. We now have Cityfibre’s response. “We are disappointed by today’s result because we continue to believe it is not right for consumers to be misled into thinking copper-reliant connections are ‘fibre’ broadband. The decision is particularly disappointing in light of the recent progress made in other countries which have restricted misleading advertising and established clear rules to distinguish full fibre from inferior copper-based services. We are currently considering appealing the judgement and would like to thank the thousands of people that joined our campaign and signed our petition for change. I now look forward to ADSL being called fibre due there being something like 1m of it connecting a block in the exchange to the network core. “Fibre to the X” is a long-standing term within telcos to describe use of fibre within the access network, not the core network. Predating even Virgin’s 2008 advertising campaign. “Fibre inside the exchange to the ADSL rack” has, for some unknown reason, not caught on yet. Why not keep it simple. It’s either Fibre or it’s Hybrid Fibre. @Lyncol Exactly the approach we took. 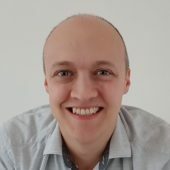 Mark: As you may be aware but many reading here will not; this case is not really about the technical merits of the fttc/fttp naming but but was about the basis on which ASA made its judgements Cf had effectively to prove that the decision was so irrational that no reasonable body could have made it. Thats such a high hurdle that the ASA will usually win. Indeed. The case was always almost certain to fail for this very reason … ASA went through a reasonable process to reach their answer, and that’s all that matters. Still, it has given CityFibre a bunch of free PR over the months, and lets a whole bunch of scallies re-argue the same old stuff for years more. Just wondering: Could an appeal be made to the European Court of Justice (ECJ) ? Os is this the end of the story, and UK consumers will continue to be mislead by false fibre-broadband adverts? Still domestic appeals. Don’t see ECJ has any jurisdiction on this point of law but its not stopped them in the past. The ECJ/CJEU cannot overrule a member state’s courts on anything bar matters of EU law and even then ECJ judgments are subject to interpretation by member states’ courts. Subsidiarity: member states are the keepers of their own laws, the ECJ the last keeper of EU law. Member states’ courts decide if a case goes to the ECJ, however there are some circumstances when, by treaty, they are obliged to do so. Thats the theory Carl but not always the reality. The ECJ has preoved very activist/expansionist in its interpretation. Neither assertion above about the ECJ is accurate. In relation to this case if the Appelant is given ‘leave to appeal then an application can be made to the next appellate court above, but must be made on a point of law and not as to the content of the trial itself. The ECJ is an appalete court above our own domestic highest appalete court, the Supreme Court. What is accurate is that a JR is about the examination of whether an authority has acted properly and not ultra vires. In this case the Administrative Court has ruled not. And that is notwithstanding the bizarre nature of taking a Regulator to trial at some expense, I suspect with costs presumably being awarded to the appellant for the use of a noun and the varied use thereof! Corrections welcomed – thank you. Not sure what marketing terms have to do with long term strategic rollouts, or the UK’s position in worldwide FTTH rankings, though. Openreach want to do more FTTP and are looking at retiring copper to make it financially practical. They aren’t doing it because there was a threat that their CP customers could no longer call FTTC “fibre”, they’re doing it to support higher speeds and so that their CP customers can keep up with the likes of Virgin. If users want speed, they’ll seek it out and pay for it, regardless of the marketing term slapped on it, and regardless of the underlying technology. Most people don’t know the difference between a virus and a bacterium. Does Mr Justice Murray’s ruling allowing copper broadband to be advertised as fibre mean it is irrelevant whether drug companies advertise their medicines as being effective against bacteria or viruses or both? If the ignorance of the consumer is the primary determinant in deciding how things are advertised then we are all doomed! Slight feeling that some of those who commented above would not be interested one bit if their cabinet had been upgraded a few years ago to FTTC. Please back it with some proper sources. Just because FTTC is sufficient for you as a BT employee/consultant doesn’t make your claim a general truth. Is anyone else drawing comparisons between Greg Mesch and John Hammond (Richard Attenboroughs character in Jurassic Park) about half way through the film? I’m guessing it’s cost a fortune in legal fees too. Similar to the cost of building Jurassic park methinks. The ASA is a disgrace. Shame on that useless quango. It isn’t fibre broadband unless it is fibre to the home. Dial up can now be classed as fibre broadband. I can buy 30Mbps “fibre” from Gigaclear if I lived in the handful of properties they serve. It is of course FTTH by default. I can buy 40Mbps “fibre” from BT, regardless of whether Openreach has deployed FTTC or FTTH in my area. Let’s say I have an average copper line that can support that service. Tell me, what’s the practical difference between them, in your eyes, that means one can be called “fibre” and the other can’t? You can upgrade to 100 Mbps, or even to near 1Gbps with fibre. Fibre offers a more reliable service. It can support symmetric speeds. Just to name a few. Answering the wrong question. I am asking what the practical difference between two real world products is. I wasn’t asking about what ifs. Stability… FTTC is affected by atmospheric noise, cross-talk etc… resulting in jitter, latency spikes and even complete drops and resyncs. This is observed as ‘rubber-banding’ in games, distortion/echo in VoIP (important considering the incoming phone changes) and a sub par service. FTTP is less prone to these issues (being if you experience them it’s not due to the technology used). Can’t help thinking that the B4RN spokesperson’s hate campaign is very damaging to their brand and neither inspires anyone to invest in the sluggish crowd-funder or improving the Thinkbroadband connection quality ratings. An interesting PoV, although this doesn’t appear to be supported by the evidence of their historic progress, otherwise they wouldn’t have connected well over 5,000 homes and raised millions in investment so far. Likewise only a very few people pick up on the comments made in news articles and for most it will be inconsequential. And this is why the CityFibres argument loses and the ASA wins. I’ve been saying the same for ages. You’re right… they wouldn’t change their mind because it’s still the best they could get. However… if they had the option of “fibre” or fibre then they probably would and this, I believe, is the core issue of the complaint. Basically, it’s an illusory truth effect (also known as the validity effect, truth effect or the reiteration effect) which is the tendency to believe information to be correct after repeated exposure. So you are telling me that over the years, people have come to believe that they have had fibre delivered to the premise when ordering FTTC or Virgin cable? Even knowing full well an engineer never actually cabled anything new to them? Most people I know assume their Fibre broadband is delivered using fibre optic cable. They don’t generally know that to get actual fibre requires an engineer, drives dug up or guys on ladders flinging another cable across, those that do know that, know they haven’t got ‘fibre’ and are likely vocal about false advertising. Also don’t forget that for new FTTC and Virgin installs, an engineer had probably visited the home and would have been inside the property changing face plates etc. The home owner assumes at that point that fibre is being installed. And there in lies the problem, how do you sell real fibre optic cable and it’s benefits when the majority of the general public believe they already have it due to what has really been false advertising all these years. When I explain to friends and family that think they have fibre optic cable to their door that it is nothing other than bog standard telephone cable and the fibre could be hundreds of metres away, they often don’t believe me and I get the response “That can’t be right, it would be false advertising to call it Fibre, you must be wrong”. I’ve had that a few times or words to that affect. On ASA ruling just shows how ignorant people blinds the masses. How can you except the simple end user to be able to comprehend the difference when you brainwash them? How should the Hyperoptic product be described when it’s CAT6 to the apartment. VDSL is fibre terminated hundreds of metres away from the property, delivery to the property isn’t over data grade cable but modulated over plain old telephone cable, and fails on the speed degrading over distance test. Hyperoptic is not fibre to the customer interface. That picture you’ve put at the top of this news story is great, it’s amused me! Made me smile! Cityfibre say fibre does not need powered cabinets. Strange as VM and Gigaclear have them. Who cares? What has that got to do with ASA case and the issue of false fibre-broadband advertising? @GN – Read the case document. An important part of the greater reliability of full-fibre infrastructure is that it bypasses the need for a street cabinet, which has electronic components and needs a power supply and is therefore vulnerable to weather, power supply disruption and other potential issues. CityFibre are correct. It obviously doesn’t need them – see Openreach FTTP. VM due to the infrastructure they have in place made the decision to build OLTs in the field. Gigaclear could have acquired property to host their equipment throughout but made the decision not to. Aren’t the Gigaclear ones needed as that’s the point they hand over from their fibre to the Openreach long distance backhaul fibre that they rent? They chose to do that to cabinets rather than to a building. It makes sense given the areas they are covering. CityFibre are building in, well, cities, so it makes sense for them to acquire property. VM have a lack of physical space in some of their sites and chose the architecture they did. Not uncommon among cable companies to use streetside OLTs for RFoG – they are increasingly moving the intelligence in the cable network out of hubs and both centralising and distributing. Can be done either way is the point, though. 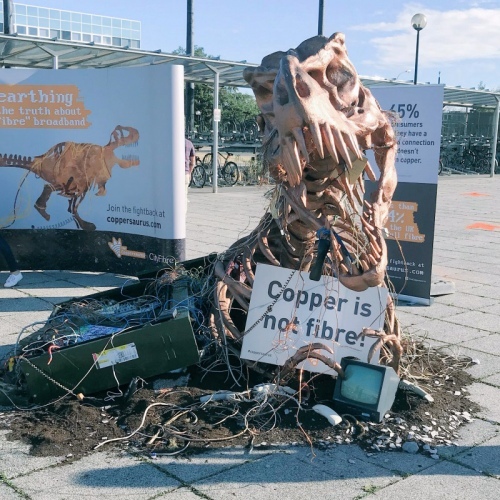 In my opinion CityFibre’s campaign was as dead as a dinosaur from the outset. What they failed to realise is that a vast majority of people do not care whether their broadband arrives via fibre or copper or both – they just want it to work and be fast enough to work for what they need, which for most people isn’t 1Gbit capable fibre (not yet anyway). And since when were CityFibre a consumer champion? This was a cynical self-serving exercise designed to simply to elevate their profile and, if successful, give themselves a marketing advantage over the competition. Everyone in the market is now going full tilt to roll just full fibre anyway so their position on this is completely redundant. Translation: the consumer doesn’t care about “full-fibre”. iii)	If the wholesale roll-out of full-fibre services across the UK is to be viable, then sufficient numbers of consumers will need to appreciate the superiority of full-fibre services and choose to take up full-fibre services over inferior part-fibre services. Then call it full-fibre. Sorted. The consumer doesn’t care about full fibre as they think they already have full fibre. That’s the point. The marketing has confused them. Nothing would be described as Fibre to the Exchange, because you buy a service from the Exchange/PoP to your home. Not something delivered to the Exchange itself. ATM is carried over other things. It’s not a physical layer. It can be carried over microwave but can’t be used in an either-or. Some of the comments above are daft. I’m glad this ISP Shad tried to do something about this but sadly it’s too late. Marketing hybrid services as fibre should never have been allowed in the first place. Now the British public are thoroughly confused. I can’t tell you how many times I’ve had to explain to people that they don’t have fibre to the home. Countless times at home and at work (I work in the industry). So the point is that because people think they already have fibre they don’t see the point in upgrading to FTTP. Added issue of why upgrade if what you have works. @TheFacts: Why are you so afraid of honesty? If, as you claim, it doesn’t matter how broadband is delivered, then there is nothing to be lost for you when fibre-broadband is only called such when it’s actually fibre, and hybrids are called what they are: VDSL, cable, ADSL etc. The point is, promoting a lie is morally wrong, it is a despicable act. What’s to prevent agencies like ASA not to do it again? Do we really want to end up in a lawless telecom’s wild west?